Please support Little Alfie Evans, he Needs Your Help Now! There’s a little baby boy at the Alder Hey Children’s Hospital in Liverpool, England whose life is on the line. He has an unusual, undiagnosed disease and is currently in a coma and suffers from seizures. This little baby’s name is Alfie Evans and he doesn't have much time left. Ever since New Year’s Eve 2016, the hospital has tried to switch the life support off on Alfie. They said that they would take legal action if the father, Tom Evans, refused the hospital’s choice. The father, a baptized Catholic, has fought all the way to the UK Supreme Court and even appealed to Pope Francis, who has invited Alfie to receive treatment at the Vatican’s Bambino Gesù hospital in Rome. Sadly, the UK Supreme Court denied Mr. Evans permission to take his son to Italy and has permitted the hospital to remove Alfie from his ventilator effectively Monday, April 23. This most likely will result in little Alfie’s death! Give Your Support to Alfie's Parent to Send him to the Bambino Gesù hospital. He deserves treatment not death! You see the craziness in the whole situation? Why shouldn’t they send the sick child to a charitable hospital willing to take him in! Instead, they allow this innocent baby’s life support to be cut against his parent’s wishes! 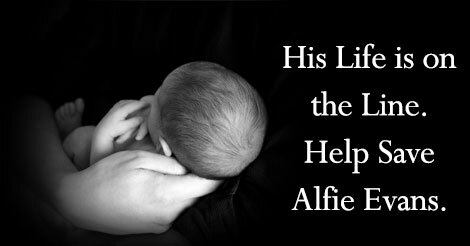 Please sign this petition and pray for Alfie’s sake. You have my total support and heartfelt prayers to save little Alfie’s life. You are suffering the insanity of the modern world that promotes the culture of death. I am with you and your son. May God bless you and your family.